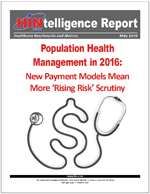 White Paper Abstract: Population health management (PHM) perpetually ranks as the healthcare space richest with opportunity, according to HIN’s annual industry trends snapshot. But just how do healthcare organizations accrue clinical and financial gains from PHM’s data-driven, risk-stratified care coordination approach? By providing chronic care management (CCM) services, say the majority of respondents to HIN’s latest comprehensive Population Health Management survey. Ninety percent of respondents practicing PHM report a CCM component to their program, with 12 percent of those committed to CCM enjoying PHM ROI between 2:1 and 3:1. In condition-specific PHM metrics new for 2016, diabetes is by far the primary health target for PHM interventions, say 88 percent. Download this HINtelligence report for more data on the use of data analytics in population health management, medication management in population health management and the level of patient served by population health management programs.